Terasa Ilfil Juga kalo terlalu sering mendengarkan 1 genre beberapa hari ini, biasanya dengan sajian dasyat Irama Brutal Death Metal, tapi kayaknya juga butuh penyegaran baru untuk genre musik yang gw sukai lainnya, Symphonic Death Metal ! makanya gw pengen mencoba album anyar, band Symphonic Death Metal terkenal Finlandia, Eternal Tears Of Sorrow !, Masih dari scene Finlandia yang sudah menjadi gudang-nya band2 genre Non Brutal Death Metal ( Prosentase Pertumbuhannya memang kalah Pesat dinegeri ini .ed ), sejak terbentuk tahun 1994, Eternal Tears Of Sorrow telah melalui Evolusi Progres bermusiknya, dari Thrash Metal lalu Melodic Death Metal hingga akhirnya lebih kental nuansanya Symphonic Death Metal. Band yang masih menyisakan 2 member aslinya ini, Gitaris Jarmo Puolakanaho dan Bass/Vokal Altti Veteläinen ini masih mengingatkan sekali sentuhan permainan gaya Amorphis lama, The atmosphere of this album is very promising. The band did not turn themselves into a total symphonic death metal band. If I were to specify their genre I would definitely call it symphonic/melodic death metal. Their techniques have really improved and their range, too. Altti's vocals have improved a lot, going from a high, distinctive pitch to a low, more of a death metal pitch. The usage of the clean vocals in this album is more of gothic metal, but they still manage to keep it more of a melodeath type. melanjutkan hitam perjalanan Waktu mereka setelah album " Children of the Dark Waters " tahun 2009, band ini harus kehilangan Lead Gitaris berbakat Risto Ruuth, dan ga lama setelah itu tergantikan oleh Kehadiran Mika Lammassaari dari band Mors Subita untuk kembali melanjutkan rangkaian Tour panjang Album " Children of the Dark Waters " serta kembali menulis beberapa lagu baru. tahun 2013 Eternal Tears Of Sorrow kembali menawarkan Materi barunya dengan terlebih dahulu melepas single " Dark Alliance " setelah band ini memutuskan bergabung dengan Massacre Records. Their guitars have really progressed in producing the melodies since their latest release. The mix between the rhythm and lead guitars is really good, too. The keyboards provide a very good atmosphere for the album of both symphonic and melodic death, not falling to any of the two genres completely. yup memang pada awal mula kenal band ini gw sangat menyukai sentuhan Gloomy melodius-nya dengan kemasan yang Sadly dan epic menyentuh ruang hampa gw cieeeee ...... Ok langsung aja setelah dimulai dengan sebuah Intro " Dark Alliance " tetap menjadi Hits Andalan untuk mengisi urutan terdepan album gress ini. is in fact pretty reminiscent of something Insomnium or maybe Omnium Gatherum would do, at least in the verses - fair enough you might say, as Eternal Tears of Sorrow have long been overtaken by those bands in the popularity stakes. tetap menawarkan komposisi musik yang semakin matang dan melodius dengan balutan hitam atmosfir Keyboards yang terasa begitu mendominasi setiap struktur musiknya. Harsh dan Growl Vokal Altti Veteläinen masih garang mengisi bersama Vocalis Jarmo Kylmänen yang kebagian pada Clean Vokal. sentuhan kuat Amorphis lama, Dark Tranquility, Kalmah serta gaya Children Of Bodom Mungkin yang bisa sedikit gw gambarkan disini. The packaging is certainly fancy, and the idea of symphonic death metal is alluring, but many of the melodies and orchestrations seem fairly obvious and familiar, as if there are never any surprises lurking around any corner. A few songs do create a worthy background atmosphere. " Legion of Beast " masih begitu kental gaya Melodic Death Metal-nya jika Gw bandingkan dengan track sebelumnya, Altti lebih menggunakan Gaya Harsh Vokalnya untuk memenuhi tuntutan Konsep lagu dengan beat yang cepat. The guitars have come front and center, and during the course of the album blistering leads and thick melodic riffs abound. At the same time the band is more in touch with their symphonic side than ever, with authentic strings occupying just the right amount of the compositions found here, as well as the band''s trademark piano intros and brilliant keyboard solos The intensification of both guitars and strings makes it the most powerful statement to date of the haunting gothic metal sound they began to delve into on Chaotic Beauty. dan yang bikin suasana hati gw semakin galau kala track romantis seperti " Sound of Silence ", Eternal Tears Of Sorrow masih eksis menampilkan Female Vokal Miriam Elisabeth Renvåg yang lebih dikenal sebagai " SfinX " adalah Vocalis band Avant-garde Black/Gothic Metal asal Norwegia, Ram-Zet, semakin menenggelamnkan kesunyian malam apalagi sayatan solo Gitaris Jarmo Puolakanaho begitu teduh dan cantik menggelayut menyatu dengan suasananya, Keren !!! 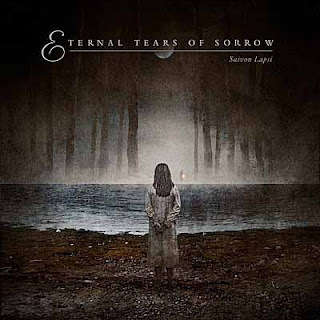 dan memang jika gw dengarkan, konsep musik Eternal Tears Of Sorrow ini lebih kompleks dengan gaya Gothic, Doom, Melodic hingga Folky banget, sehingga kesan asyik akan terasa pas suasana rileks, so sangat gw rekomendasikan sebagai obat anti galau hahahaha ..... Let's just start by saying this is one of the greatest releases for this band. They've waited a long time to release this album. True, but I can guarantee it's worth the waiting. The work they've put through in this album is really worth mentioning. They've managed to improve their performance and live up to their legacy. So this album is a must buy. Feels ilfil Also if too often listen to one genre these days, usually with terrible dish Rhythm Brutal Death Metal, but I think also need a refresher new genre of music that i like others, Symphonic Death Metal! that's why i want to try new album, the band famous Finnish Symphonic Death Metal, Eternal Tears Of Sorrow!, Still of the Finnish scene that has become his warehouse band2 Non Brutal Death Metal genre (Percentage Growth Growth was lost in this country. ed), since the establishment of In 1994, Eternal Tears Of Sorrow has been through the evolution of musical progress, of Thrash Metal and Melodic Death Metal thicker until nuance Symphonic Death Metal. The band that still leaves these two original members, guitarist Jarmo Puolakanaho and Bass / Vocals Altti Veteläinen still reminds one touch of old Amorphis-style game, the atmosphere of this album is very promising. The band did not turn into a total Themselves symphonic death metal band. If I were to specify their genre I would definitely call it symphonic / melodic death metal. Their techniques have really improved and their range, too. Altti's vocals have improved a lot, going from a high, distinctive pitch to a low, more of a death metal pitch. The usage of the clean vocals in this album is more of gothic metal, but they still manage to keep it more of a melodeath type. Black continued their journey time after the album "Children of the Dark Waters" in 2009, the band had lost a talented Lead guitarist Risto Ruuth, and ga long after it was replaced by the presence of the band Mors Mika Lammassaari Subita to resume a series of tour length album "Children of the Dark Waters "and re-writing some new songs. 2013 Eternal Tears Of Sorrow again offer new material to release first single "Dark Alliance" after the band decided to join with Massacre Records. Their guitars have really progressed in producing the melodies since their latest release. The mix between the rhythm and lead guitars is really good, too. The keyboards provide a very good atmosphere for the album of both symphonic and melodic death, not falling to any of the two genres completely. yup it at the beginning of this band know i really like Gloomy touch with his melodic Sadly packaging and vacuum gw epic touch cieeeee ...... Ok immediately wrote after starting with an Intro "Dark Alliance" remains a mainstay Hits album a frontrunner to fill this gress. is in fact pretty Reminiscent of something or maybe Omnium Gatherum Insomnium would do, at least in the verses - fair enough you might say, as Eternal Tears of Sorrow have long been overtaken by those bands in the popularity stakes. still offers a more mature musical compositions and melodic with a black bandage Keyboards atmosphere that seemed to dominate every musical structure. Harsh and Growl Vocals Altti Veteläinen still fierce filled with Jarmo Vocalis Kylmänen who gets on Clean Vocals. strong touch of old Amorphis, Dark Tranquility, Kalmah and Children Of Bodom style that might be a bit i describe here. The packaging is certainly fancy, and the idea of ? ?symphonic death metal is alluring, but many of the melodies and orchestrations seem fairly obvious and familiar, as if there are never any surprises lurking around any corner. A few songs do create a worthy background atmosphere. "Legion of the Beast" is still so thick Melodic Death Metal style her if Gw compared with the previous track, Altti more using Harsh vocal style to meet the demands of the concept of the song with a fast beat. The guitars have come front and center, and during the course of the album blistering leads and thick melodic riffs abound. At the same time the band is more in touch with their symphonic side than ever, with authentic strings occupying just the right amount of the Compositions found here, as well as the band'' s trademark piano intros and brilliant keyboard solos of The intensification of both guitars and strings makes it the most powerful statement to date of the haunting gothic metal sound they Began to Delve into on Chaotic Beauty. and that makes the mood more troubled when gw romantic tracks like "Sound of Silence", Eternal Tears Of Sorrow still exist featuring Female Vocals Miriam Elisabeth Renvåg better known as "Sfinx" is the band's avant-garde Vocalis Black / Gothic Metal from Norway, Ram-Zet, the silence of the night let alone incision menenggelamnkan solo guitarist Jarmo Puolakanaho so shady and beautiful hanging together with the atmosphere, AWESOME!!! and indeed if i listen to, the concept of Eternal Tears Of Sorrow music is more complex in the style of Gothic, Doom, Melodic until very folky, so the impression would seem fitting fun relaxed atmosphere, so so i recommend as anti troubled hahahaha ..... Let's just start by saying this is one of the greatest releases for this band. They've waited a long time to release this album. True, but I can guarantee it's worth the waiting. The work they've put through in this album is really worth mentioning. They've managed to improve their performance and live up to their legacy. So this album is a must buy.